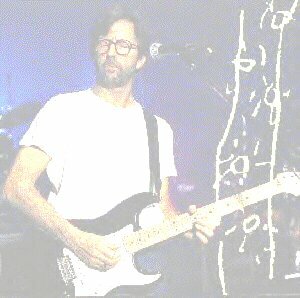 CLAPTON keywords include the following: BEGIN, END, TUNING, DEFINE, NOTE, CHORD, TUNE, and WAIT. The BEGIN and END keywords are used to signify the beginning and end of the program, respectively. All program statements must be after the BEGIN and before the END. The TUNING keyword, followed by a tuning name, tunes the guitar strings to their appropriate pitches for that tuning. The tuning name can either be one of the common tunings included with the language, or a tuning that the user creates using the keyword DEFINE. The user provides the name for the tuning and to what pitch each string will be tuned to. The NOTE keyword, followed by a note, will cause all occurrences of that note on the fretboard to be displayed in green, so the guitarist can easily find them. The CHORD keyword, followed by an input string of the chord the guitarist wishes to play, will cause a CLAPTON program to display the guitar fretboard, with all notes in the given chord highlighted in green. This is the heart of the language, it allows the guitarist to see what notes are needed for the chord, and where all of them are. This is the exciting part, because the guitarist can choose any combination of these notes to create their own unique voicings. And keep in mind, this is any chord for any tuning. Most guitarists feel helpless when not in the comfort of standard tuning, and finding any given chord would take most guitarists (even Clapton!) a significant amount of time. CLAPTON programs open up all the chording possibilites of the guitar! The TUNE keyword, followed by a string number and a note, will change the tuning of the given string to the given note. This is useful for tunings that are only slightly different from a more common one. The TUNING command actually uses the TUNE command six times to tune the guitar. Finally, the WAIT keyword, followed by a number (in seconds), will cause a CLAPTON program to keep the display on the screen before a new chord/note is displayed, or the program exits. For example, using the WAIT command after each CHORD command allows the user to "page through" a chord progression, allowing time to find and play the chord before the next one.